As I relax here during the holidays, this is a great time to write-up a quick review of 2018! We launched Curio 12 in the Spring of 2018 with an extremely popular request: markdown support! Writing in markdown, and exporting/importing markdown text, lists, mind maps, and more were extraordinarily useful additions to Curio's bag of tricks. 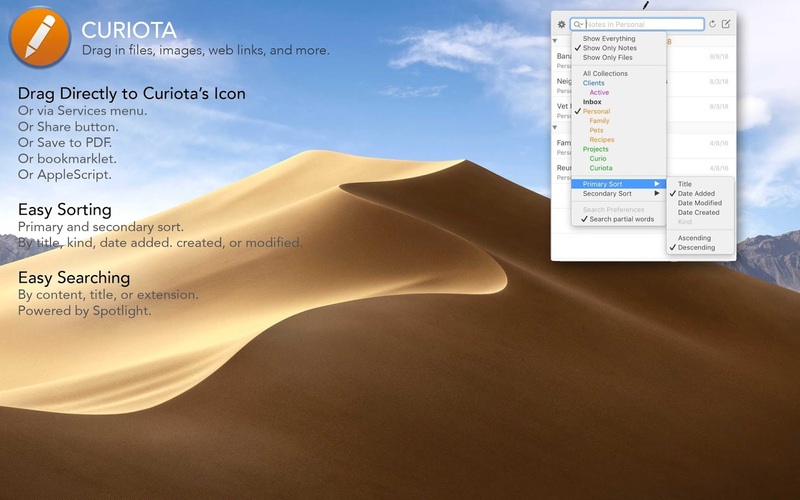 In 2018 we also finally revealed our long-awaited Curiota 3 update! Our free, fast note-taking and file-collecting whiz kid app now supports dark mode, detachable windows, and a major user interface overhaul! In May the GDPR European privacy initiative came into effect and Zengobi was ready with changes not just Europeans but globally so everyone has the same privacy protections. Basically anything that didn't need to be collected was tossed, and anything that was collected is now carefully documented. This took a substantial amount of time but it's the right thing to do. And, as I say every year, I truly appreciate all the wonderful customers that make Zengobi possible! Here's to 2019 and another year of awesome developments! New, free updates to Curio 12 have released over the past few weeks. Curio Professional and Standard text figures now support markdown inline code (monospace) syntax. Plus new support for importing markdown lists containing a mix of bulleted and numbered list elements into Curio list figures. Idea space link Quick Look support. 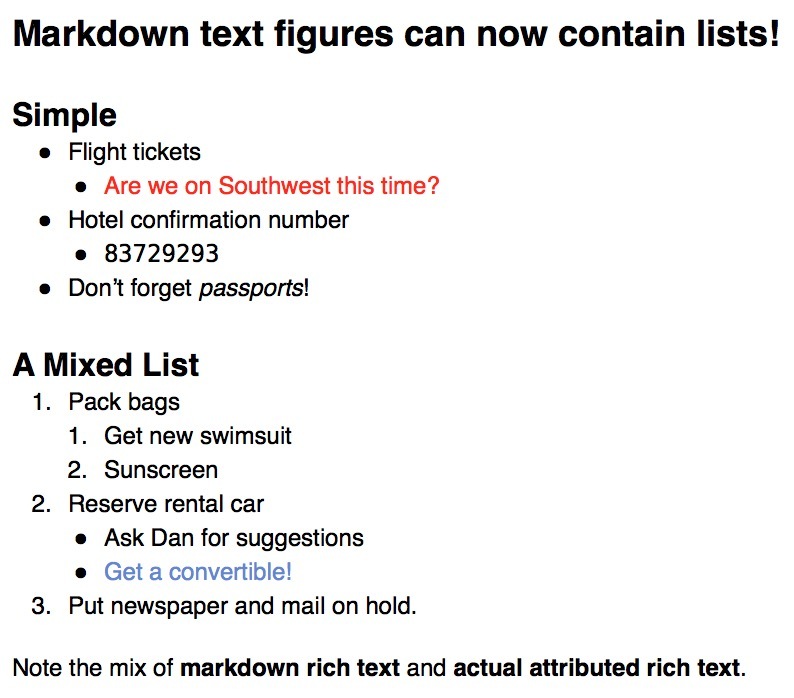 Curio Professional and Standard text figures now support inline markdown lists! Definitely one of our most popular requests since Curio 12's initial release. More flexible alert to fix broken aliased assets or jumps. Again, these are free updates for existing Curio 12 customers. Curio should notice the updates automatically or you can choose the Curio > Check for Updates menu item. For customers on older versions of Curio, discounted upgrades are available to Curio 12 Professional, Standard, or Core. Note that Curio 12 requires macOS Sierra or High Sierra. Curio 11.2, a free update to Curio 11, has been released! PRO STANDARD Sleuth: DEVONthink Pro Office integration. PRO STANDARD Sleuth: YouTube & Vimeo searching. PRO Status shelf: Live HTML, RTF, and CSV exports. PRO Status shelf: Ignored projects. Percent complete from resources support. Tons of other tweaks and fixes. The complete details are in the Curio 11.2 release notes so be sure to check it out. I hope everyone is safe, warm, and well. Last October began Zengobi's 14th year in operation! It's amazing that Curio has been so well received and I truly appreciate everyone's support, feedback, and comments. I'm currently working on a fantastic huge update to our free Curiota app available at the Mac App Store. Hopefully I'll get that wrapped up very soon. I've submitted updates to Curio Express and Reader... just waiting for Apple to give them the okay. Time for another periodic reminder: please keep backups of all important data! A customer wrote just the other day who had a catastrophic hardware issue that resulted in data loss. I personally keep a Time Machine backup (to an OWC external drive), a Carbon Copy Cloner full drive nightly backup (to another OWC external drive), and a BackBlaze off-site backup. The Time Machine backup has come in handy numerous times. I've fortunately never needed either the CCC or BB backup, but I sleep better knowing they're there. All are relatively inexpensive especially compared to potential loss of data. Today marks the 10th major release of Curio! This is a huge milestone for an application we started back in late 2002, over 13 years ago! It's amazing how far it's come and what an fantastic personal experience starting Zengobi and creating Curio has been for me. But, enough about me, let's talk about Curio 10! 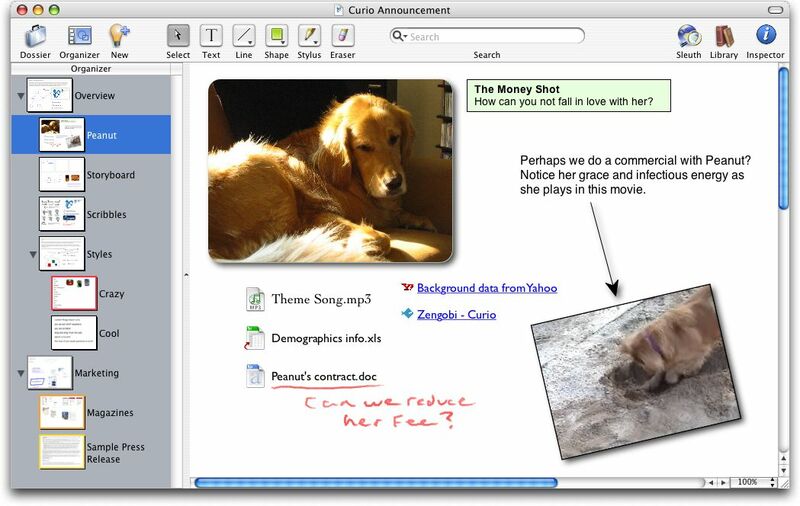 Curio 10 adds loads of new brainstorming, note taking, and task tracking features I know you'll enjoy. Check out the What's New section on the main Curio site to learn more about all the new features including a new Stacks collection, interface enhancements, mind map & list sorting, mind map import/export improvements, table enhancements, tag emoji, and much, much more. One of the big new features is actually a separate product that extends Curio 10's functionality. We've had lots of requests for more ways of getting notes and data into Curio, ideally even if Curio isn't running. We've solved this with Curiota, our new, free app available at the Mac App Store. 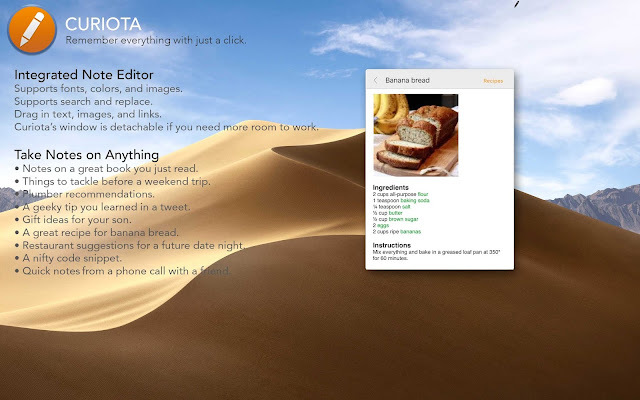 It runs all the time, takes up very little memory or CPU, and provides a menu bar icon for you to quickly take notes or drag in files. You can even bring in notes and files via Services, Share, Save PDF, bookmarklet, and AppleScript. The items you collect with Curiota are stored in an open, easily accessible format that Curio 10 can search through and display using its new Local library shelf for easy integration with your Curio projects. We have lots of great plans for Curiota with more amazing features coming very soon. Get ready for school with Curio! For a limited time, purchase a new license to Curio 9 for just US$79.99 or Curio Express for just US$29.99. Curio is hugely popular with academia -- both professors and students -- for taking class notes, collecting research materials, preparing class lectures, and much, much more. This sale ends Saturday, August 29th, 2015 so don't miss it! The next version of Apple's OS X, El Capitan (aka 10.11), is available for beta download before its official release this fall. Unlike more recent OS X major releases, this release appears to trend towards fixes, performance, and robustness versus introducing major new features (à la Snow Leopard over Leopard and Mountain Lion over Lion). We have a few customers running Curio 9 full time with El Capitan and no issues have been reported, nor have we noticed issues here. However, it should be emphasized that El Capitan is indeed a beta release. You will experience OS X bugs and crashes. It should not be installed on your primary machine or used with important data. The El Capitan codebase will change many times before its fall release as improvements and fixes are made. If you decide to install the beta, preferably on a second machine with copies of your Curio project data, please let us know if you experience any issues with Curio.